When you leave a comment on THIS post by 6 p.m. CT Tuesday, July 22, 2014 you'll be entered in the DRAWING for a copy of the book below. If you mention in your comment that you’re a follower (see in the left column “Join This Site” and “Follow by Email”), I'll add your name a second time in the drawing. You must have a U.S. mailing address to receive a paper book. You can read details about my book giveaways at Disclaimers. Author of thirty novels and novellas, Carol Cox has an abiding love for history and romance, especially when it’s set in her native Southwest. As a third-generation Arizonan, she takes keen interest in the Old West and hopes to make it live again in the hearts of her readers. A pastor’s wife, Carol lives with her husband and daughter in northern Arizona, where the deer and the antelope really do play—within view of the family’s front porch. When Amelia Wagner takes over her father’s newspaper in 1893 Granite Springs, Arizona, she vows to carry on the paper’s commitment to reporting only the truth. But Amelia soon learns that even the truth can have serious consequences. Her father’s revealing articles about the Great Western Investment Company have caught the attention of the wrong people, and pressure mounts for Amelia to retract her father’s statements. Determined to find out the real story, Amelia begins her own investigation. She’s joined by Benjamin Stone, a Western employee who’s been assigned to keep tabs on her for the good of the company, a man Amelia finds both perplexing and intriguing. What they uncover stuns them both—and has far-reaching implications for not only Ben and Amelia but all of Granite Springs. Can they reveal the truth before the enemy finds a way to silence them for good? When her father dies, Amelia Wagner becomes the owner and operator of his newspaper in 1893 Arkansas. Her father had instilled in her that a newspaper writer always told the truth. The Great Western Investment Company wants her to retract statements her father published. After small incidents don’t scare Amelia enough to retract the statements, the company assigns one of their employees, Benjamin Stone, to get close to her and convince her to retract the statements. Instead of doing that, Benjamin recognizes her bravery and helps her to uncover proof to back up her father’s articles. Cox writes memorable characters, vivid settings descriptions, and emotions of the heart. This book has ample tension to keep the reader turning pages. Remember: leave a comment on THIS post by 6 p.m. CT Tuesday, July 22, 2014 and you'll be entered in the drawing for a copy of TRUTH BE TOLD by Carol Cox. Please, please remember to leave your email address. I'll need your email address so that should you be the winner I can get in touch with you. I'll announce the winner in next Thursday’s blog. Did you leave your email address? The winner of last Thursday’s blog post winner for a copy of A WEDDING FOR JULIA by Vannetta Chapman is Melanie. I’ll email you. Thanks all for commenting. Watch for more book giveaways. Would love to read this. I love Carol Cox books. Thanks for the give-away. teshaw(at)sbcglobal(dot)net. Tammie, you're welcome. Thanks for leaving your comment. I love love love Carol's writing and SO excited to know she has another release. Thank you! Amy, you're welcome. Thanks for stopping by and leaving your comment. Amy, thanks for letting me know you follow my blog. I enjoy her books and have been looking forward to reading this one. Michelle, thanks for coming by and leaving your comment. 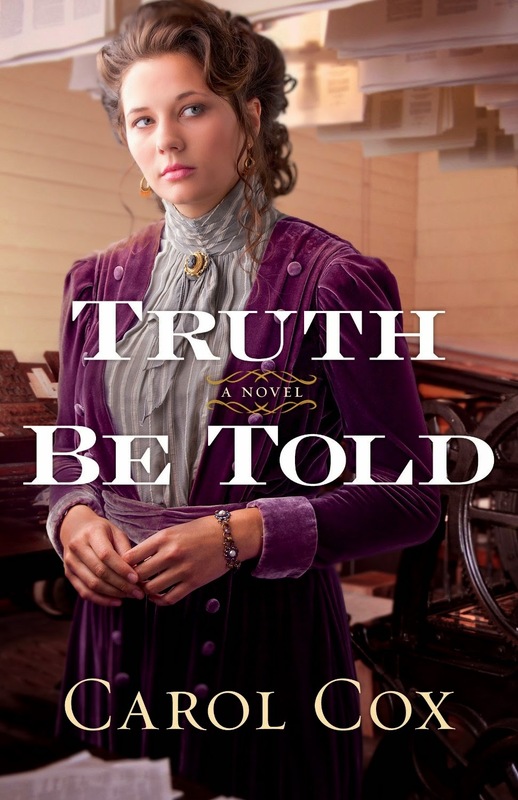 Truth Be Told sounds like a great story, I love that it is historical romance with a mystery to unravel. Please add me! Merry, yes the book has a mystery to unravel. I appreciate following my blog! Thanks for your comment. I am certainly intrigued by this one, Jo. Suspense and romance are a good duo! I am definitely a follower!!!! Melanie, you're welcome. I appreciate you being a follower! Thanks for leaving your comment. Carol, We have your books in the church library but not this one. I am a follower of this blog. Janet, you're welcome. Thanks for reading and leaving your comment. I appreciate you following my blog! Truth Be Told sounds like a wonderful story! Thank you so much for sharing!! Britney, you're welcome. Thanks for following my blog! Glad you stopped by and left your comment. +1 - Sounds like a neat mix ... I've read and enjoyed Carol Cox's books in the past. Thanks for the chance to win! The Artist Librarian, you're welcome. Thanks for leaving your comment. I appreciate you following my blog! Maxie, you're entered! Thanks for coming by and reading. I appreciate you following my blog! Thanks for your comment. I've read one of her books and enjoyed it. This one looks good too.